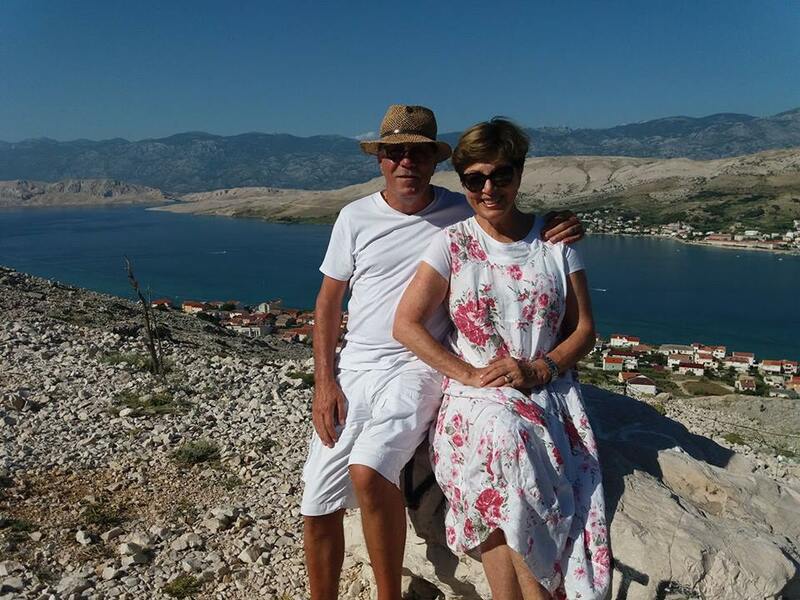 A day spent exploring on the exotic Island of Pag…. It was thanks to this wonderful woman that we started this series, so it’s only fitting that I get to share her story. Robyn Vulinovich, I am very selfishly glad you lost your voice for the B2B Conference because it meant we have connected and shared some wonderful experiences since! Robyn is someone who is forever praising others for the work they do, whether it be other expats or small business owners around Croatia, thank you Robyn for your passion and positivity you spread. ‘Born and raised in Sydney, as a young Australian of Irish heritage, a student at Waverly Teacher’s College at 18 yearsof age, I was destined to meet a young immigrant who had recently arrived in Australia , the land of opportunity and adventure! A totally by chance meeting in a crowded coffee shop, and on that day my ‘fate’ was sealed, entering another world, a world of romance and stories about a far away magical sounding land called Croatia, in those days, a part of the former Yugoslavia. No amount of telling me about his homeland prepared me for my first visit all those years ago. As we travelled along the highway between Split and the Makarska Riviera, I gazed out at the scene beyond. The majestic Biokovo mountain range soaring from the sea shore to the dizzy heights above. Little villages along the way nestled in the bays of azure waters, remnants of the days of the powerful dominance of the Venetian Empire, followed by the Austro-Hungarians. Terracotta tiles, well worn limestone walkways, olive groves, figs, cherries, and grapevines, donkeys, homemade wines and cheeses, and olive oil for sale. Signs along the road advertising Sobe/Zimmer Frei/ Camere’ (Rooms to let) But it was the absolute beauty and colours of nature that took my breath away on that very first trip. The sheer magnificence of this rough and rocky landscape helped me to better understand the people of this harsh rural environment. The soft Mediterranean Sea against the harsh landscape, a sharp contrast, yet it has created through history, since the 7th century, these Croatian people with enormous strengths and resilience, while at the same time possessing warm hearts full of romantic passion and love of their homeland. I was for once and forever in love with Croatia. Back in Australia, for many years we were very successful in business as restaurateurs of Italian Cuisine, although our lifestyle was extremely busy, dramatic at times, consuming many hours of hard work and at the same time taking care of our children and family obligations we managed to now and then slip away for a holiday to Croatia to restore our senses. Following the passing of my husband in 2004 I made a firm decision to de-stress, and restructure my lifestyle resulting in a new direction escorting small groups to the hills of Tuscany, relaxing and indulging in cuisine and wines under the Tuscan sun. However, after a number of years spent travelling between Australia and Italy with intermittent visits across the Adriatic to Croatia visiting family and friends, I felt the urge to settle in a place where I felt comfortable and at peace, a place where I could both work and live in harmony with the environment and within a safe community. In 2010 the decision was made! It happened as I awoke one morning! I simply asked myself, ’Where in the world do you want to be for the rest of your life?’ The answer was forthcoming immediately! My intuition was screaming at me and so I happily packed my bags, bought my ticket and followed my basic instincts! The following chain of events then took place; a position working for an Australian Travel Agency as tour director on a mini cruise boat was offered, and for the following 6 years I sailed between Split and Dubrovnik, meeting so many amazing people, making many excellent contacts while deciding to make my home in Split. Once again romance knocked on my door and a second marriage followed in 2013. Split has provided me with all that I need, all that I was hoping to find. My expectations have been fulfilled. Today I am self employed as a tour consultant assisting independent travelers and small groups. My services at My Hidden Croatia provide the guest with a personalized program, according to their interests, suggested food and wine options, meeting the food artisans and producers, attending social events, art and cultural events, suggesting accommodation, cruising and adventure tourism. I work in conjunction with a few local unique travel agents who are like minded, providing excellent service, guides, vehicles and drivers. The slower pace of life.. The safe and pollution free air in a land of great diversity and scenic beauty. Attitude of many government employees in government departments. Easier legal procedures in government offices. Better and more efficient communication by email with government bodies. I have always had excellent working relationships with the Croatian Travel agents, boat owners, guides and tour operators. I choose my Croatian business co-workers very carefully, and would never recommend a service, accommodation or company to my clients without first visiting the premises, inspecting the boats, experiencing the restaurant etc. A successful tourism business is largely achieved by word of mouth, the building of a reputation as an honest entrepreneur follows the careful attention to detail and adhering to sound business ethics. Advice for foreign entrepreneurs thinking of coming to Croatia? Never assume anything..rules, laws, and conditions are changing constantly while the country develops following independence and recently becoming a member of the EU. Contact the Croatian Embassy in your country to find the correct information that you require before making any definite decisions. Don’t expect all to be ‘plain sailing’ during the time of setting up a business. Be prepared for delays, mistakes, misunderstandings etc, however, a word of advice, a pleasant polite attitude together with a warm smile will get you everywhere!